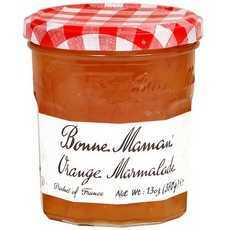 Enjoy Bonne Maman Orange Marmalade Preserves. Bonne Maman Is The Number One Selling Line Of Specialty Preserves Providing The "Gold Standard" Against Which All Other Premium Preserves Are Measured. Ingredients: Sugar, Oranges, Cane Sugar, Fruit Pectin, Citric Acid (Note: Description is informational only. Please refer to ingredients label on product prior to use and address any health questions to your Health Professional prior to use.